A kind of nerve swap, cutting a damaged nerve and moving a healthy nerve into its place, helped patients regain the use of partly paralyzed arms, Chinese surgeons reported Wednesday. Patients who got the surgery were able to once again tie their shoes and use mobile phones with a once-useless hand and arm, the team reported in the New England Journal of Medicine. The surgeons believe they have helped the body rewire the nerves to make the damaged arm useful again. But critics say it's not clear what caused the dramatic effects and say it will take more testing in more patients to see how useful the new technique will be. And it's also not clear how many patients could benefit from such an approach. Dr. Wen-Dong Xu of Huashan Hospital in Shanghai and colleagues worked on patients who had arm damage from strokes or brain injuries. The damage caused what's known as spastic limb paralysis, which results in uncontrolled nervous signals to the affected arm. "The spastic arm posture impairs activities of daily living, such as hygiene and dressing, and may cause pain," they wrote. Patients suffer jerking, stiffness and other uncontrolled movements. "It is estimated that 30 percent to 60 percent of stroke survivors are unable to use their paralyzed hand," Xu and colleagues wrote. They randomly assigned 18 patients for surgery and 18 for rehabilitation alone. They cut the nerve that goes from the damaged arm into the spine at the neck — precisely at the C7 (7th cervical) vertebra. Then they swapped over a nerve from C7 on the other side of the body, hooking up a new pathway to the brain. The uncontrolled spasticity stopped immediately for some patients, and that could have been the result of cutting the affected nerve, the researchers said. But within 10 months, patients were regaining use of the affected arm. 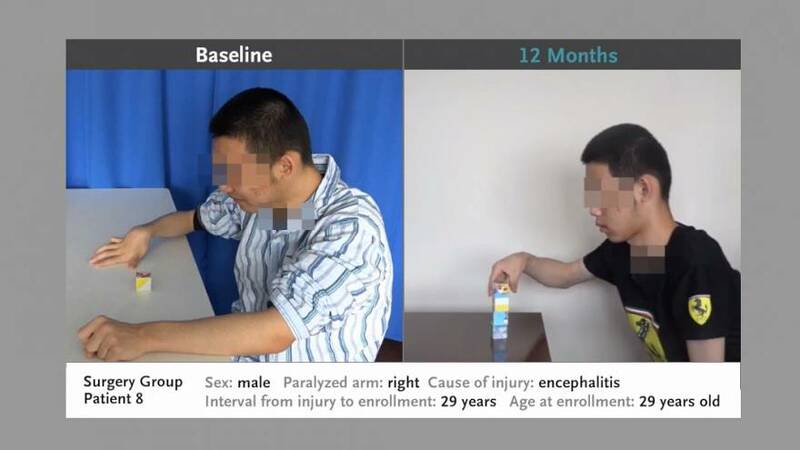 "Over the 12 months of the trial, the ability to reach and to open the hand improved in patients who had undergone surgery, such that they were able to dress, wring out a towel, tie their shoes, and operate a mobile phone with the assistance of the paralyzed hand," they said. They recorded dramatic video of patients using their hands again. But three outside experts were skeptical about what caused the recovery. "In our opinion, the results of the trial are exciting but need clarification and confirmation," Drs. Robert Spinner, Alexander Shin and Allen Bishop of the mayo Clinic in Rochester, Minnesota wrote in a commentary. "We don't doubt their conclusion and it is very exciting, but we question what's really causing the improvement," Spinner told NBC News. "The question we have is which cut is causing the improvement — because by cutting just the affected side, you can decrease the spasticity. Is there some way that this is causing the improvement that we see?" Xu's team specializes in this type of surgery, and they said that cutting off the bad signals from the damaged nerve may have caused the immediate benefits, and allowed the arm to gradually recover. It's tricky surgery, Spinner noted. It would be good news if simply severing the damaged nerve did the trick. "If it's just snipping the bad nerve, that's a lot easier than doing the operation on the good nerve and trying to get away with it," he said." I think it would open up new vistas for spinal cord and brain injuries."